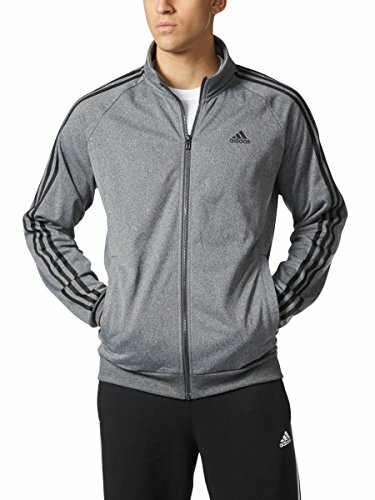 Adidas Men's Essential 3 Stripe Tricot Track Jacket - Big & Tall, Dark Grey/Heather Black, 2XLarge-Tall | What Should I Say? This Men's Essential 3 Stripe Tricot Track Jacket from Adidas provides a warm and comfortable top layer for before and after training. Big & Tall sizes, Jacket, Great for running and training, Full standup collar, Front welt pockets, Ribbed cuffs and hem help garment stay in place, Full center front zip, Polyester.